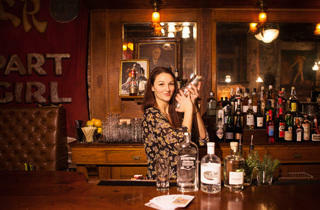 Photograph: Martha Williams Bartender Liz Pearce runs The Drifter. 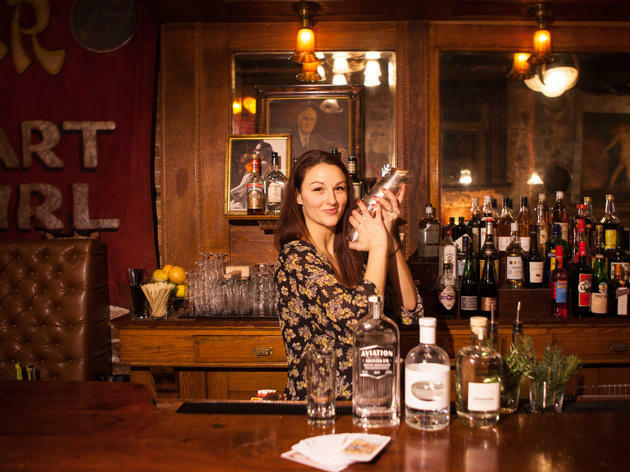 After getting her start in “the diviest of dive bars” in Fargo, North Dakota, Liz Pearce moved to Minneapolis then to Chicago, where she worked her way up at great bars (she has the Aviary, Drawing Room and the Gage on her resume). This week, she opened the Drifter, a cocktail bar located next to the Green Door Tavern. It’s a former speakeasy that until recently just had been used for private parties, but now Pearce will be serving up $12 cocktails, along with an edited list of beers and wines. We caught up with Pearce to talk about her approach to making drinks, how she took over the space and what to expect at her bar. How did the Drifter come about? I got connected with this project through Dirk Flanigan [The Gage, soon to be Il Coniglio], who was helping to evolve the food menu at Green Door. He talked to the owner about opening up the space, I got thrown into the mix, and I went down there and it was an amazing spot. There’s a ton of history and it’s a very welcoming feeling when you walk in those doors. We didn’t do very much at all to the space, if anything we took things down from the walls. The only things we’ve added are seating and a little bit more lighting and put in a sound system. Otherwise, it’s pretty much the same as it’s been for 100 years, and it was really important that we stay true to its original look and feel. What's your approach to making cocktails? My style is very culinary. I use a lot of shrubs and things like that, and spices. I like exotic flavors, and as far as things to work with, I love Scotch and I love rum. I’ll drink those straight, in sours and daiquiris. What else do you drink on your night off? Miller High Life. I also love wine and I’m a big wine geek pursuing a level two sommelier certificate, so I do a lot of practicing for that, you could say. How do you come up with new drinks? I’ll read things like Food and Wine and think, This would be good as a cocktail, and I write down ideas. So I had quite a few ideas and it was a jumping-off point for how we developed them [at the Drifter]. Then I went to the Wirtz Alchemy Room, and played around for a couple days and came up with some really original drinks. Some have roots in classic cocktails, some are riffs on classics and some are totally bizarre new things. What are some drinks you’re making that people should drink now? Our signature cocktail is shaping up to be the Upstate, a Manhattan riff. It’s got some rye whiskey in there, walnut liqueur, a little bit of sweet vermouth and some chocolate bitters. It’s a Manhattan warmed up for winter. Also, the Leblon James Vesper is kind of a martini variation; it has cachaca, Imbue Petal & Thorn Vermouth and some Combier Pamplemousse Rose grapefruit liqueur. It’s really bright, citrusy and boozy, and like summer flavors in a winter form. How will the menu be arranged? Since I have a huge Rolodex of cocktails, we modeled them after some tarot cards. We’ve essentially put them onto cards and guests are given a small deck of cards that we choose from the bigger deck each night. We’ll let the cards dictate what the menu will be, and then the guests can choose from those. And there’s an entertainment component, right? There will be something going on every night. What we’re basically telling people is that we’re looking for eccentrics. It’s like a side performance, not like a dinner theater or cabaret, and we’re not going to be putting on full shows. It’s something to break up the night and something interesting to look at. What do you want to achieve with the bar? After working at some of these great bars in the past, I have this insane need to create, and I think having such a large, dynamic program will help me sleep better at night and allow me to indulge my creativity. Also, I want to be able to bring really good cocktails to a neighborhood spot. Hopefully we’ll give them something cool to do and something cool to drink.